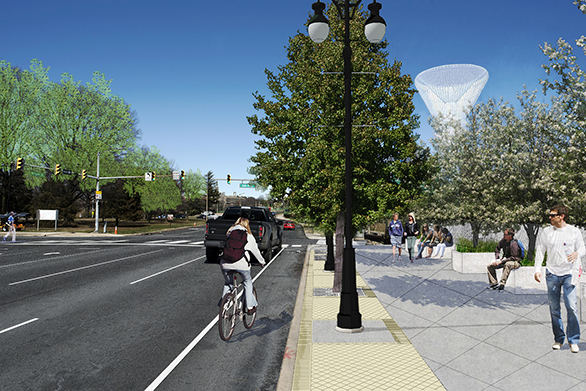 Traffic cones and work crews will soon arrive on Lee Highway in Rosslyn as long-planned pedestrian and bicycle upgrades to North Lynn Street, Lee Highway and the adjacent segment of the Custis Trail get underway. The joint project between Arlington County and the Virginia Department of Transportation (VDOT) will widen sidewalks and add a new on-street bike lane along North Lynn Street, widen the Custis Trail to 16 feet from its current 10 feet and make a number of other crosswalk, intersection and streetlight upgrades to improve safety and accessibility for people walking or biking in this heavily used Arlington gateway. These changes will transform the look of both Lynn Street and Lee Highway. At some points, sidewalks will be up to 20 feet wide, providing more space for pedestrians, including larger gathering areas near crosswalks. 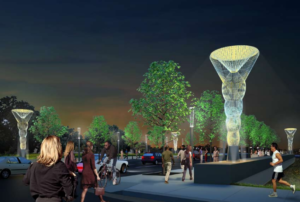 The project will also support elements of a new public art installation, called “Corridor of Light,” at each of the four corners of the Lynn Street bridge over I-66. Custis Trail users will enjoy a significantly different experience, too, not just because of the wider trail. Plans for the project include doubling the width of the grass buffer between the trail and Lee Highway to 6 feet. And, to accommodate the change, one travel lane will be removed on Lee Highway, reducing the overall footprint of the vehicle travel lanes relative to the trail. From start to finish, the full package of improvements will take about two years to complete. The first step, expected to begin by the end of May, is installation of a new water line under the left lane of westbound Lee Highway. This work will block the left lane, but the other two lanes will remain open. 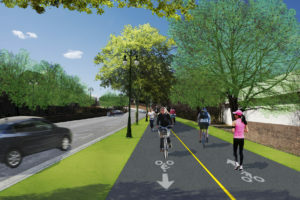 Other closures and detours, including on the Custis Trail and adjacent sidewalks, will occur at various points throughout the project. This project incorporates improvements found in the 1999 Esplanade Study, the 2003 Rosslyn Circle Safety Study and the 2006 Lynn Street Esplanade Preliminary Design Study. Meetings with area stakeholders began in 2005 as part of project initiation and continued through 2016 when final plans were submitted to VDOT. Throughout the design process, County staff has engaged area residents, businesses, community groups and commissions for direction and feedback. Arlington transferred the main construction responsibility for this project to VDOT in 2016. For more information and project updates, including planned road, sidewalk and trail closures, visit the County and VDOT project pages. Photo credit: “Corridor of Light” nighttime rendering provided by Cliff Garten Studio.